September 1991 finds us sitting in the hot sun in the Schlossgarten in Karlsruhe. The geranium filled urns standing on the balustrade in front of us have a classical perfection, which contrasts sharply with the aspiring jugglers in the park beyond. The trees are a heavy late summer green. It is hot, hot, hot and we are tired after long days driving and a twenty-five hour fixing session. This is our latest adventure ‑ the first was in 1987 when we climbed a scaffold in the Grays Inn Road and carved an inscription on the front of the Eastman Dental Hospital, since when we have worked in quarries and mason's yards and on enormous building sites and we’ve even gone by boat into the middle of the river Clyde to put letters on to granite pillars. 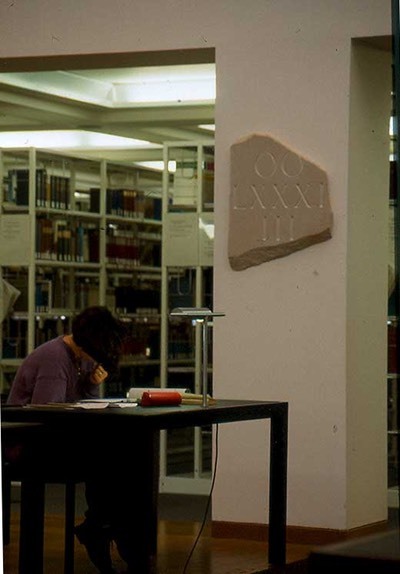 Classical references are rather on our minds today as we have just completed an Ian Hamilton Finlay commissioned scheme for the new Baden State Library designed by the German architect O.M. Ungers. For us this job began over a year ago when Ian sent us the plans of the library and asked us to design sixteen fragments for the square pillars around the domed reading room. We did some drawings and he liked them. We got on a plane and went to Karlsruhe. The building was up ‑ part of it was already open to the public ‑ but the reading room was still unfinished. We pinned our drawings to the pillars. At this stage everything was still very fluid the only fixed element was the width of each pillar which enabled us to set the width of the widest line. The final carvings were to be random fragments and convincing randomness is harder to achieve than regular shapes. Nevertheless the drawings looked promising. We went to Cologne to see Ungers and our presentation went well. We came away dancing and we were driven back into town in an impressive leather‑lined Mercedes Limo. We looked at some art in the new Museum Ludwig and then we got on the train back to Karlsruhe. The Rhine valley looked lovely for long stretches of the four-hour journey. We celebrated with an expensive bottle of Gewurztraminer. Back in England we rented our usual cottage by the sea, and set off for Dorset to look for the stone. This wasn't quite as easy as we'd imagined. 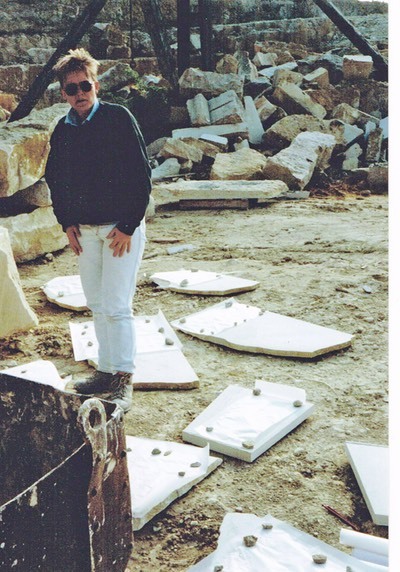 It took us most of a week shifting bits of stone around and deciding just which pieces would be OK. Our fingers froze and our backs got sore and we shouted at each other as the drawings blew about or crinkled up as they got damp. None of this really mattered though and as always we were stunned by the magic of being at the quarry. The stone gave off its mysterious, powerful light and the spectacular Purbeck skies made it all worthwhile. We discovered Pon Freestone, very clean, almost without shell and sweet to cut. We found some ready-made fragments in the stacks of scants ‑ the stone had broken along natural faults. We preferred these bits, which we could leave untouched, but others needed a little help. Taking our clue from the 'natural' bits we asked a quarryman to shape some edges for us. We drove back home with the stones standing on edge and tied to the sides of the old Ford Transit, which we'd hired. Miraculously they all arrived intact and as we stacked them up in the studio the late August deadline seemed pleasantly far away. We got on with other jobs, we had a hectic end of term, and we helped hang Fine Words Fine Books at St Pauls. 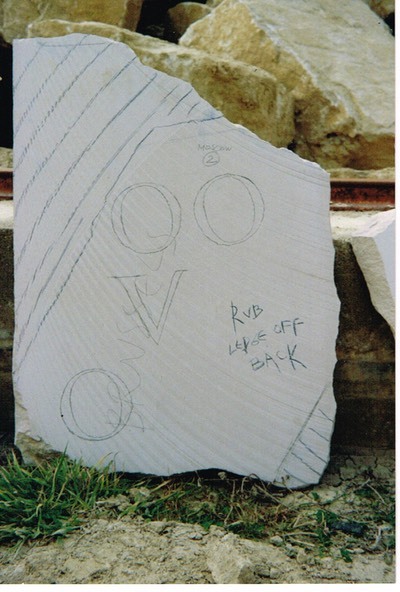 Sometimes we pulled out a piece of stone and carved a bit or looked at the drawings and made an alteration. Then suddenly, it was July and we were booked to carve for four days at Art in Action. Slight panic started to hover around but we took a few of the stones with us to Art in Action at Waterperry and enjoyed carving them there in between talking to what seemed like thousands of interested onlookers. Back at the studio once more time seemed to concertina abruptly. We'd decided to deliver the finished pieces ourselves so we had to start organising the trip. We took it in turns to carve and to telephone. The van had to be hired, crossings and hotels booked, customs papers and laiding manifests organised. We learned a lot. We got excited about the trip as we picked up our hired Merc 208D and started to load. We wished we knew about knots but with the help of a large roll of bubble and a lot of square foam cushions we did the most marvellous pack. The next day we left London in good time to catch a late boat the sun shone and went down beautifully as we approached Dover with not a little trepidation. We braved weigh bridges and hordes of lorry drivers in the freight department and breathed a sigh as all the customs procedures went without a hitch and we didn't have to unpack anything. We waited to board the boat flanked by vast container lorries. We ate our smoked salmon sandwiches and drank half a bottle of champagne. When we were eventually on board and standing on the deck looking at the moon's silver trail to France we looked at each other and asked ourselves, not for the first time, if we'd ever thought that Lettering could lead to all this fun! Theories are nothing but colourless equations. The doing is all that matters! 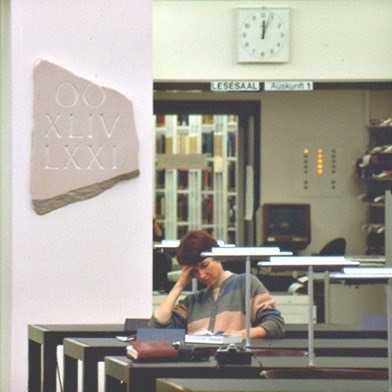 llustrated are some of the 12 roughly 600 x 400 mm fragments for the Reading Room of the Baden State Library Karlsruhe. 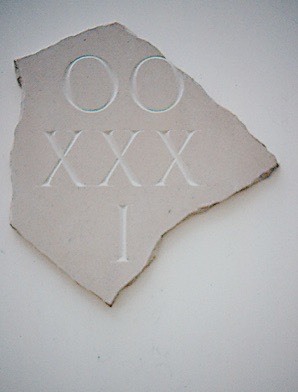 A collaboration with Ian Hamilton Finlay, Architect O.M. Ungers.